2016.12.6 tue.–11sun. 11:00 a.m. –6:30 p.m 6th: opens at 2:00.p.m. 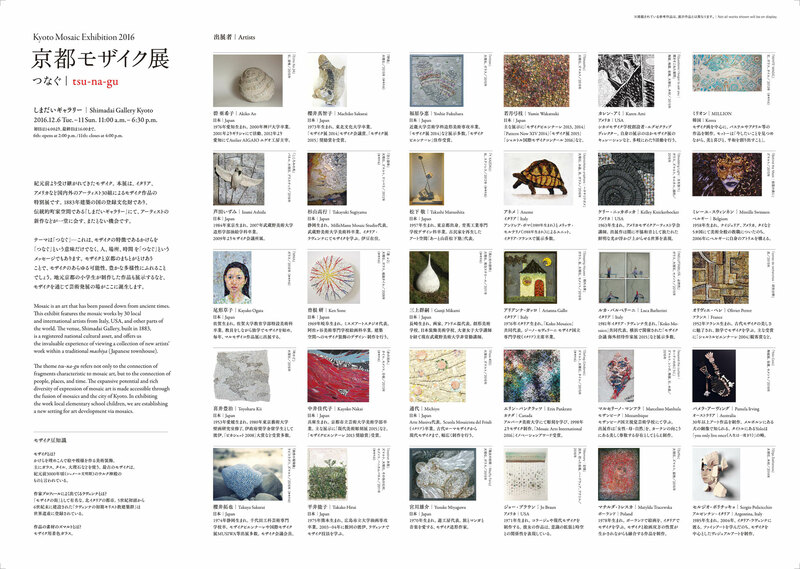 /11th: closes at 4:00 p.m.
◎Artists’ Presentation (Free entrance) 2016.12.10 Sat. Participating artists will talk about their work. Open to the public. Mosaic is an art that has been passed down from ancient times. This exhibit features the mosaic works by 30 local and international artists from Italy, USA, and other parts of the world. 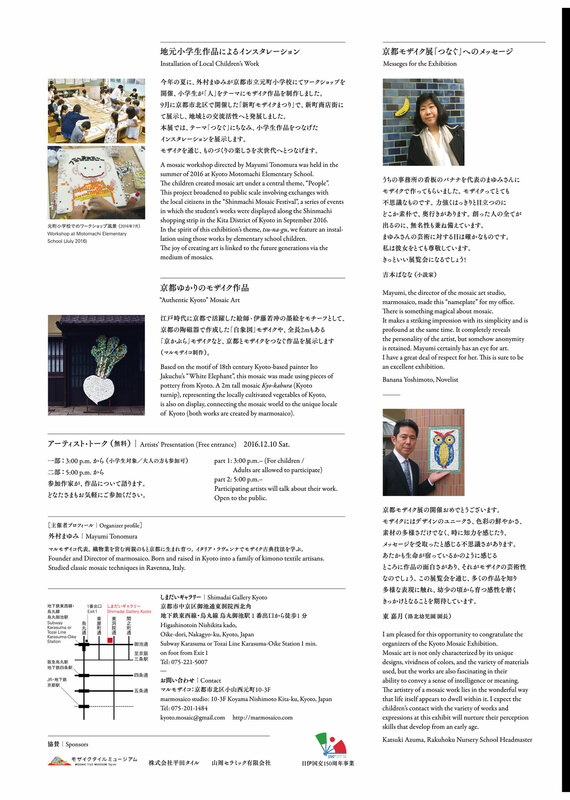 of viewing a collection of new artists’ work within a traditional machiya (Japanese townhouse). establishing a new setting for art development via the medium of mosaic. 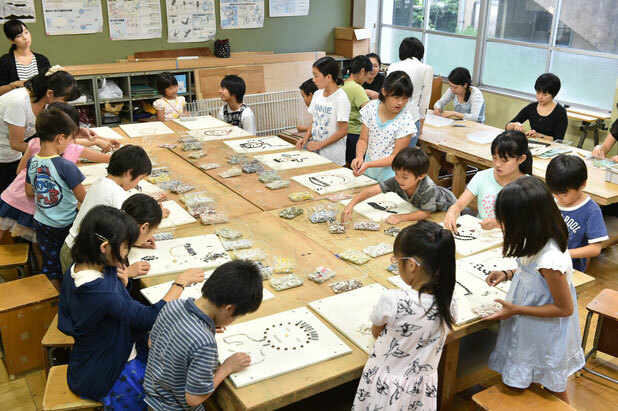 A mosaic workshop directed by Mayumi Tonomura was held in the summer of 2016 at Kyoto Motomachi Elementary School. The children created mosaic art under a central theme, “People”. This project broadened to public scale involving exchanges with the local citizens in the “Shinmachi Mosaic Festival”, a series of events in which the student’s works were displayed along the Shinmachi shopping strip in the Kita District of Kyoto in September 2016. In the spirit of this exhibition’s theme, tsu-na-gu, we feature an installation using those works by elementary school children. The joy of creating art is linked to the future generations via the medium of mosaics. 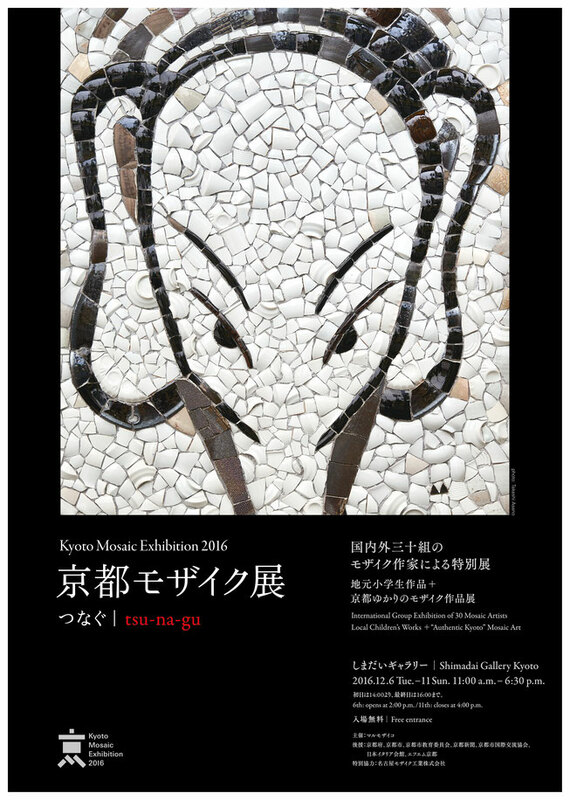 Jakuchu’s “White Elephant”, this mosaic was made using pieces of pottery from Kyoto. 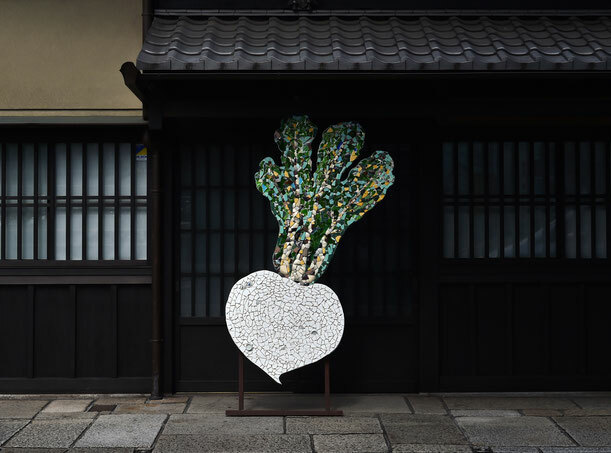 A 2m tall mosaic Kyo-kabura (Kyoto turnip), representing the locally cultivated vegetables of Kyoto, is also on display, connecting the mosaic world to the unique locale of Kyoto (both works are created by marmosaico). 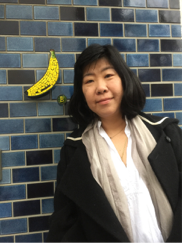 Mayumi, the director of the mosaic art studio, marmosaico, made this "nameplate" for my office. There is something magical about mosaic. It makes a striking impression with its simplicity and is profound at the same time. It completely reveals the personality of the artist, but somehow anonymity is retained. Mayumi certainly has an eye for art. I have a great deal of respect for her. 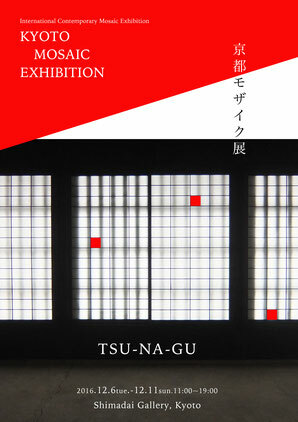 This is sure to be an excellent exhibition. 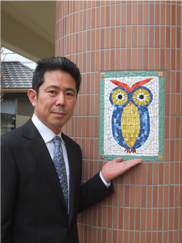 I am pleased for this opportunity to congratulate the organizers of Kyoto Mosaic Exhibition. Mosaic art is not only characterized by its unique designs, vividness of colors, and the variety of materials used, but the works are also fascinating in their ability to convey a sense of intelligence or meaning. The artistry of a mosaic work lies in the wonderful way that life itself appears to dwell within it. I expect the children's contact with the variety of works and expressions at this exhibit will nurture their perception skills that develop from an early age. Supporters｜Kyoto Prefecture・・Kyoto City・・Kyoto Municipal Board of Education・・The Kyoto Shimbun Co., Ltd.・・Kyoto City International Foundation・・Centro Culturale Italo Giapponese di Kyoto・・FM-Kyoto Inc.
Special Partners｜NAGOYA MOSAIC-TILE CO., LTD.
Sponsor｜MOSAICTILE MUSEUM Tajimi, HIRATA TILE CO.,LTD. Yamashu ceramic.